UPDATE: Skyfire has been pulled from the App Store by Skyfire, not Apple, due to high demand. Skyfire’s current server capacity can’t handle the load, but the company is planning to retool and reintroduce the app. 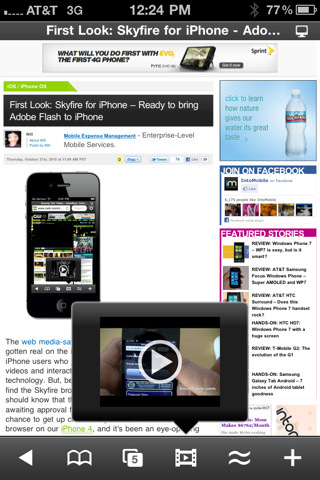 You can now get the much-hyped Skyfire browser for your iPhone (s aapl), which brings the ability to watch Flash (s adbe) content. You won’t get that for free, though, as the price is $2.99 at launch, which is described as an “early adopter price.” So is it worth it? Skyfire works by sending Flash content to its servers, transcoding it using a proxy and sending it back to your device as HTML5. However, it has its limitations. If you were planning on watching Hulu on your device through its website, for instance, you’re out of luck, since it isn’t supported. It also won’t work with Flash games. It does, however, play Flash video without issue on many sites, and provides audio, too. In my experience, it worked often, but when it didn’t, I was very disappointed. For example, streaming video from network sites here in Canada didn’t work at all. Other sites, like Current TV worked fine, albeit with some slowdowns likely caused by strain on Skyfire’s servers. Is it worth $2.99? Well, it also offers a private browsing mode, related search terms automatically combed from every site you visit, the ability to select whether pages load mobile or standard versions by default and a Facebook quick view feature that makes posting to and viewing your account while browsing easy. So as a Safari alternative, it isn’t without merit. Even with all these features, though, and with Flash capabilities, I’m not sure the app is a good buy. It seems to run slowly, and video conversion quality can vary greatly depending on the quality of your connection. Finally, it seems most are warming up to HTML5, so iOS incompatibility with Flash may not even be an issue for much longer. If this app had been around two years ago, it might have been worthwhile. Then again, the only reason Apple approved it now is probably because it knows it pretty much won the HTML5/Flash video war at this point, anyway. It ain’t too Shabby, but it ain’t too Flash either. What was that crap headline Wired used earlier today?. “Skyfire is Sold Out”. Thats bull but not the only thing/person/company that’s sold out. I only use Macs but what ever happened to letting the market decide these things. If Flash is crap it’ll die, if Flash is compelling it’ll live on. Lots of web technologies are resource hogs, so what. It’s a bun fight with Adobe. Give us a break Steve, Love Apple’s machines but hate Apple’s behavior! I was prepared to love Skyfire but re-encoding “some” flash on the fly will not fly either. Gotta laugh at the antics! Apparently lots of people want Flash even if Uncle Steve doesn’t want them to have it. Very Interesting. I have been using that app today, it’s not perfect but it’s very promising. It’s that best way yet to view flash videos on the iphone. I’m glad I got it before they pulled it. Are you kidding? It’s bad enough I have to suffer through Flash on the web, but now you want me to pay money to suffer through it on my iPhone? No thanks. Flash can’t die off fast enough for me. skyfire the app looks but it’s B/S.